Jose Alfredo Cavazos, 69, pulls a cart filled with a hay bale on his way to feed his cattle on Friday, Oct. 05, 2018, in Mission. Cavazos' daily routine is to feed his cattle and goats near the river. 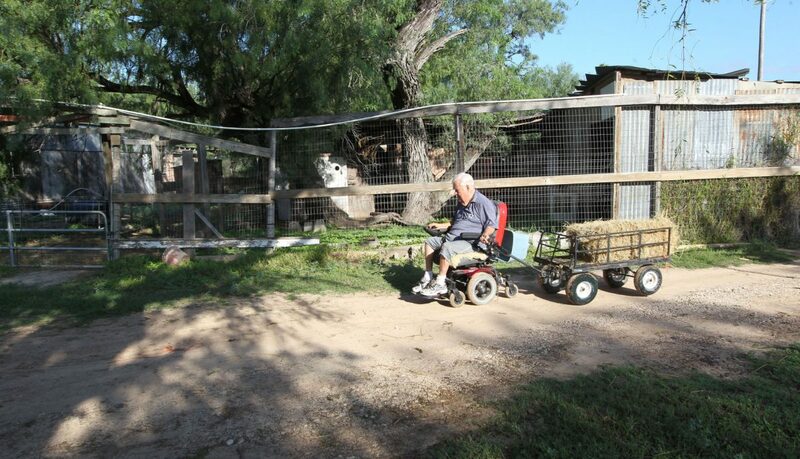 MISSION — Hauling a wagon filled with a bale of hay, Jose Alfredo “Fred” Cavazos gets around his property slowly. Confined to a wheelchair for the last 22 years, he lifted a nearly 30-pound hay bale over a gate to feed his longhorns — something of a ritual for Cavazos and his family, who are deeply rooted in the area, dating back to the original Spanish land grants of the mid-1700s. Cavazos, 69, who was left without the use of his legs more than 20 years ago, still manages his morning cattle-tending just fine. “It’s a routine for us. We’ve been doing it for many years, and really it’s not for money; it keeps us alive,” Cavazos said with a laugh. The properties, just one piece of the 77 acres of land he and his family own, sit along the banks of the Rio Grande in Mission. His sister, Eloisa Rosa Cavazos, 67, cares for him with the assistance of two additional healthcare providers. Tending to the area livestock is something of a pastime for the Cavazos family. For nearly three quarters of a century, they have shared a symbiotic relationship with the animals, the land, and the river. That relationship is now in jeopardy, as Cavazos will likely be added to the growing list of Rio Grande Valley property owners who will be affected by border wall construction expected to commence in early Spring 2019. At stake is more than the family’s farmland, but the purpose he believes keeps him alive and well, in spite of his condition. Together, he and his sister travel to the property owned by the Cavazos family for the last 69 years — located just a few minutes’ drive away from his home — to feed the animals. He’s assisted off their Chevrolet Express van via a motorized lift, and makes no haste placing hay bales at his feet and legs, propping it up like a stand. Cavazos’ fate and that of many others may have been sealed in March, when Congress passed an Omnibus Bill that funded 25 miles of border wall construction in Hidalgo County and an additional 8 miles of border wall in Starr County — all part of the Trump administration’s continued push to fulfill a campaign promise to build a wall along the U.S.-Mexico border. The 25 miles of border wall will be constructed all along the levee in Hidalgo County, affecting the properties adjacent to the river. Cavazos’ property, located just east of Chimney Park, and the Riverside Club, would most certainly be affected. He and members of his family attended an August closed-door meeting between U.S. Border Patrol officials, city of Mission stakeholders, including the mayor, and landowners like himself who would potentially be affected by construction along the levee. But Cavazos said he left that meeting with little to no hope of keeping his properties intact, saying the two barns and three homes would most likely be impacted. Not only would the levee fence construction cut off access to his farms and adjacent properties, located just south of the levee and up against the Rio Grande, the construction of an additional 150-foot road south of the levee wall to allow U.S. Border Patrol agents to patrol the area of the fence would undoubtedly cross into his farmland, he said. Cavazos and members of his family, including his cousin, Reynaldo Anzaldua, 73, of Donna, also attended the “Know your Rights” meeting in late September, hosted by Marianna Treviño Wright, the executive director of the National Butterfly Center. During that meeting, they heard from legal counsel with experience fighting land condemnation attempts by the government, and how they too, could delay the eventual construction. Treviño Wright has been at the forefront of dissenting voices against government encroachment of environmentally sensitive areas in the Valley since last summer, when she stumbled upon government contractors surveying land near the center’s property. About a decade ago, relatives of Cavazos and Anzaldua living in Granjeno were forced to relocate after border wall fencing was constructed in the area. Anzaldua, who speaks up for his cousin and his extended family, because as he puts it, “there’s no other option left,” made a trip to Washington in August to lobby against the wall. But Anzaldua said the experience left him disappointed in his Republican representatives, who declined to meet with him. Treviño Wright agrees with Anzaldua, and said that in many areas, the fencing along the levee wall will create more of a safety hazard, and do little to deter smugglers and people moving along the river. “One of the consequences of this project — of putting the border wall up here, along the banks of the Rio Grande and, in most cases, 1 to 2 miles back from the river — is that the federal government is actually going to create a landing and staging area for the kind of illicit traffic they claim to want to fight,” she said. For many locally, Treviño Wright’s encounter with government contractors on her property was the beginning of government incursions in the Valley, as the Trump administration pushed forward with plans to build, among other places, on the levee at the Santa Ana National Wildlife Refuge. Treviño Wright, along with environmentalists and locals who oppose the building of structures on historical and environmentally sensitive lands, has continued to lead the effort. It’s why she hosted the meeting for families like the Cavazos. Along with potentially damaging landowners’ property and their livelihoods, new wall construction may also have an impact on the more than $450 million that is infused into the local economy each year in the region, according to a 2011 Texas A&M University study.